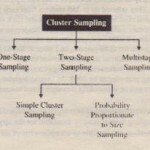 In systematic sampling, the sample is chosen by selecting a random starting point and then picking every with element in succession from the sampling frame, The sampling interval is determined by dividing the population size by the sample size n and rounding to the nearest integer. For example, there are 100,000 elements in the population and a sample of 1,000 is desired, In this case, the sampling interval is 100, A random number between 1 and 100 is selected, If, for example, this number is 23, the sample consists of elements 23,123,223,323,423,523, and so on. 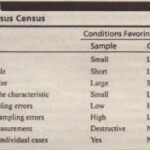 Systematic sampling is similar to SRS in that each population element has a known and equal probability of selection, However, it is different from SRS in that only the permissible samples of size that can be drawn have a known and equal probability of selection, The remaining samples of size have a zero probability of being selected, For systematic sampling, the researcher assumes that the population elements are ordered in some respect, In some cases, the ordering (for example, alphabetic listing in a telephone book) is unrelated to the characteristic of interest, In other instances, the ordering is directly related to the characteristic under investigation, For example, credit card customers may be listed in order of outstanding balance, or firms in a given industry may be ordered according to annual sales, If the population elements are arranged in a manner unrelated to the characteristic of interest, systematic sampling will yield results quite similar to SRS. On the other hand, when the ordering of the elements is related to the characteristic of interest, systematic sampling increases the representatives of the sample, If firms in an industry are arranged in increasing order of annual sales, a systematic sample will include some small and some large firms, A simple random sample may be unrepresentative because it may contain, for example, only small firms or a disproportionate number of small firms. If the ordering of the elements produces a cyclical pattern, systematic sampling may decrease the representatives of the sample, To illustrate, consider the use of systematic sampling to generate a sample of monthly department store sales from a sampling frame containing monthly sales for the last 60 years. If a sampling interval of 12 is chosen, the resulting sample would not reflect the month-to-month variation in sales, 18 Systematic sampling is less costly and easier than SRS, because random selection is done only once. Moreover, the random numbers do hot have to be matched with individual elements as in SRS, Because some lists contain millions of elements, considerable time can be saved, This reduces the costs of sampling. If information related to the characteristic of interest is available for the population, systematic sampling can be used to obtain a more representative and reliable (lower sampling error) sample than SRS, Another relative advantage is that systematic sampling can even be used without knowledge of the composition (elements) of the sampling frame, For example, every with person leaving a department store or mall can be intercepted, For these reasons, systematic sampling is often employed in consumer mail, telephone, mall-intercept, and Internet interviews. Microsoft-owned Web site that gives auto pricing and other vehicle research information to consumers. It conducted a poll to find out if people currently use or would consider using the cell phone hands-free devices conducted an Internet survey using systematic random sampling that popped up on a separate screen when every 50th visitor stopped at the Web site Of the 879 individuals who were presented with the survey, 836 responded, The results indicated that 62 percent of the respondents had never used a hands-free device, and only 54 percent were willing to use one in the future, In light of the realization that individuals are not too receptive to the idea of attaching hands-free devices to their cellular phones, it is estimated that by the year 2012, 75 percent of the vehicles in the country will be equipped with cell phone accessories. This will take place as a result of state laws that will increasingly be passed. For example, a Washington, D.C., law prohibits anyone driving in the city from talking on a cell phone without a hands-free device. Stratified sampling is a two-step process in which the population is partitioned into sub-populations, or strata. The strata should be mutually exclusive and collectively exhaustive in that every population element should be assigned to one and only one stratum and no population elements should be omitted, Next, elements are selected from each stratum by a random procedure, usually SRS, Technically only SRS should be employed in selecting the elements from each stratum, In practice sometimes systematic sampling and other probability sampling procedures are employed, Stratified sampling differs from quota sampling in that the sample elements are selected probabilistically rather than based on convenience or judgment, A major objective of stratified sampling is to increase precision without increasing cost 20 The variables used to partition the population into strata are referred to as stratification variables, The criteria for the selection of these variables consist of homogeneity, heterogeneity. relatedness, and cost, The elements within a stratum should be as homogeneous as possible, hut the elements in different strata should be as heterogeneous as possible, The stratification variables should also be closely related to the characteristic of interest, The more closely these criteria are met, the greater the effectiveness in controlling extraneous sampling variation Finally, the variables should decrease the cost of the stratification process by being easy to measure and apply, Variables commonly used for stratification include demographic characteristics (as illustrated in the example for quota sampling), type of custodial”(credit card versus non-credit card), size of firm, or type of industry, It is possible to use more than one variable for stratification, although more than two are seldom used because of pragmatic and cost considerations, The number of strata to use is a matter of judgment, but experience suggests the use of no more than six. Beyond six strata, any gain in precision is more than offset by the increased cost of stratification and sampling. Another important decision involves the use of proportionate or disproportionate sampling In proportionate stratified sampling, the size of the sample drawn On each stratum is proportionate to the relative size of that stratum in the total population In disproportionate stratified sampling, the size of the sample from each stratum is proportionate to the relative size of that stratum and to the standard deviation of the distribution of the characteristic of interest among all the elements in that stratum, The logic behind disproportionate sampling is simple, First, strata with larger relative sizes are more influential in determining the population mean, and these strata should also exert a greater influence in deriving the sample estimates, Consequently, more elements should be drawn from strata of larger relative size, Second, to increase precision, more elements should be drawn from strata with larger standard deviations and fewer elements should be drawn from strata with smaller standard deviations (If all the elements in a stratum are identical, a sample size of 1 will result in perfect information.) Note that the two methods are identical if the characteristic of interest has the same standard deviation within each stratum, Disproportionate sampling requires that some estimate of the relative variation, or standard deviation of the distribution of the characteristic of interest, within strata be known, As this information is not always available, the researcher may have to rely on intuition and logic to determine sample sizes for each stratum, For example, large retail stores might be expected to have greater variation in the sales of some products as compared to small stores, Hence, the number of large stores in a sample may be disproportionately large. When the researcher is primarily interested in examining differences between strata, a common sampling strategy is to select the same sample size from each stratum. Stratified sampling can ensure that all the important sub-populations are represented in the sample, This is particularly important if the distribution of the characteristic of interest in the population is skewed. For example, because most households have annual incomes of less than $75,000, the distribution of household incomes is skewed. Very few households have annual incomes of $200,000 or more. If a simple random sample is taken, households with incomes of $200,000 or more may not be adequately represented. Stratified sampling would guarantee that the sample contains a certain number of these households, Stratified sampling combines the simplicity of SRS with potential gains in precision. 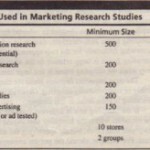 Therefore, it is a popular sampling technique.